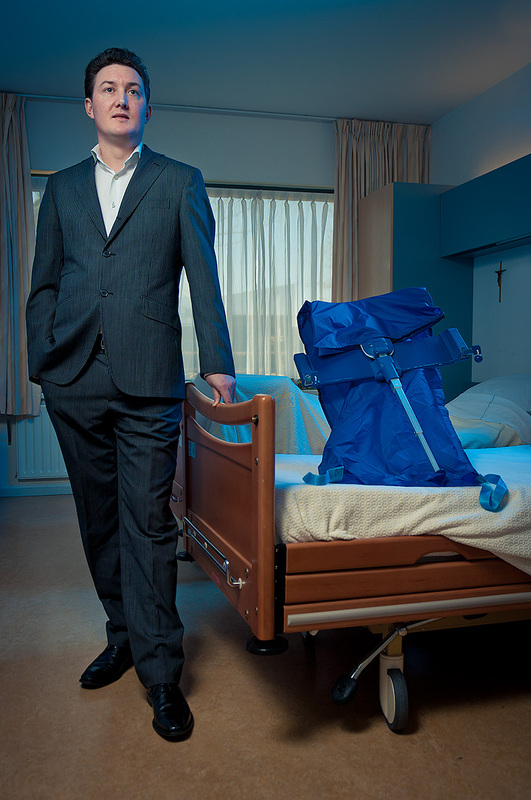 In April I had the honour to do several shoots voor Medtechpartners. 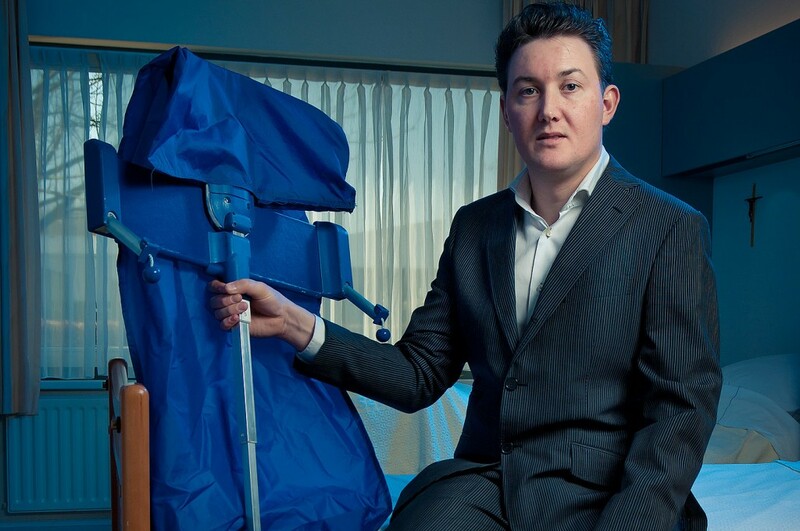 A former colleague of mine contacted me late 2012 asking me whether I was interested in doing a job involving photographing 15 entrepreneurs in the medical equipment en device industry. Who can say no to that? ( no sarcasm!). In general entrepreneurs are relative relaxed, easy going people and photographically speaking more important; the have this certain self confidence that makes them faster at ease in front of the camera. The images were intended to be included in a booklet, complementing the interviews with these entrepreneurs. Begin March the final word came through it was a GO, and with the help of an excel sheet I contacted the entrepreneurs. Now that the book has been published I thought it would be a nice idea to have a series of blogposts in which I go a bit more into the details of the shoot. The design was beautifully done by Zonize. This was the first shoot of this series and I have to be honest; I was a bit nervous. I still was struggling with what direction to go with this project. The briefing I got from Medtech Partners was straightforward and simple: head-to-toe environment portraits of the entrepreneur with the invention/device/equipment in the image as well, two alternative versions in one setting, vertical portrait lay out, A5 print size and I quote (freely translated:) “..The photography may not be too standard, .the pictures should be modern”. SO…not too standard, but modern…and within this briefing I was free to do what ever I wanted. 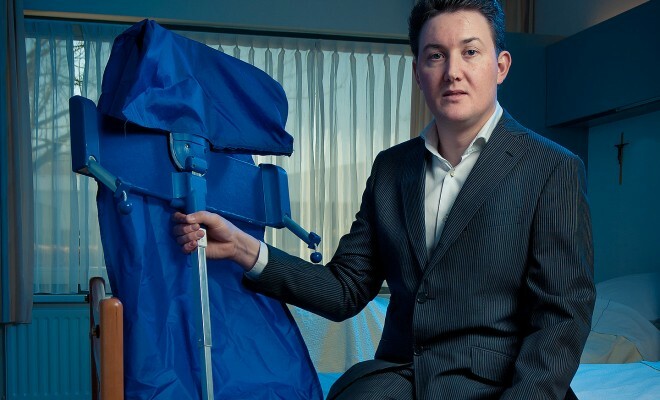 So this first appointment was with Mark van Loef, an entrepreneur/inventor who developed the Body Twister some kind of device to make it easier to get elderly and otherwise movement-disabled and impaired people in and out (hospital-)beds. On the phone we agreed that we would do the session in a real-life setting; a room in a nursing home for the elderly. My brother-in -law accompanied me that day helping me out as an assistant. On the way I still was torturing my brain on what to do exactly. My main problem wasn’t to decide upfront what and how to execute the shoot exactly in detail, I knew al the details we would deal with “on the set”. I knew upfront I would shoot 15 different men and women, with all kinds of devices and inventions, small to large so I was determined to have some central theme or concept that would act as an integrating element of the whole series. Still thinking what the integrating concept of the series would be we entered the room….a standard bedroom of a typcial nursery home. So first we decided the general direction to shoot and basic idea. Then we cleaned up the room, getting rid of all kind of clutter, going for a clean as possible shot. only thing I left hanging was the crucifix, as it was a nursery home in the “catholic heartland” of the Netherlands. I kind of thought it was a nice touch and would tell part of the story. Once I started setting up the lighting I realized the light was to be the one and only thing I would have control over all the shoots of this series. Also, in general the locations would be rather standard, not really appealing, so the interest of the photography should come from the lighting. Then it was I decided that I would go for a relative dramatic lighting of the persons, meaning side lighting with dark shadows and a back/rim lighting. And on top of that a gelled background light. 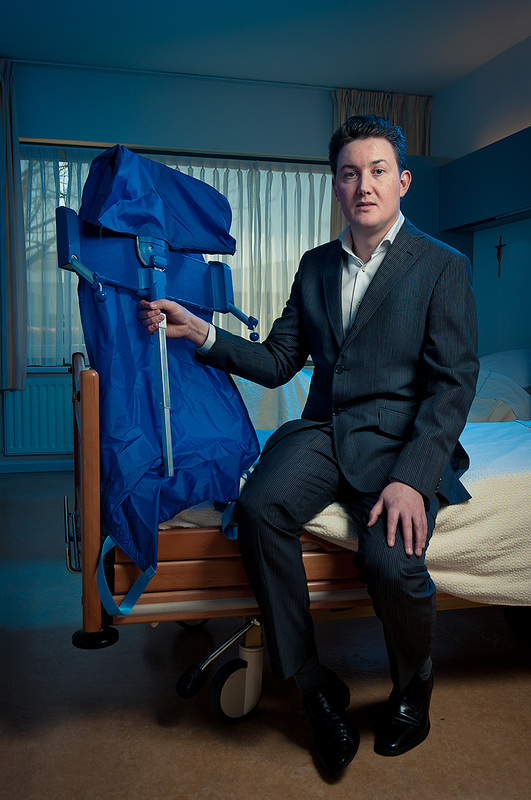 As the series depicted devices and equipment in the medical sector I thought blueish background would be appropriate. There it was, my concept: dramatic lighting on the subjects face and a darkish, blueish background lighting. This resulted finally in these images from which the first one made it into the booklet. In the following posts I’ll go into how this general concept worked out in the other shoots, what problems were to be solved, and what mistakes I made etc.